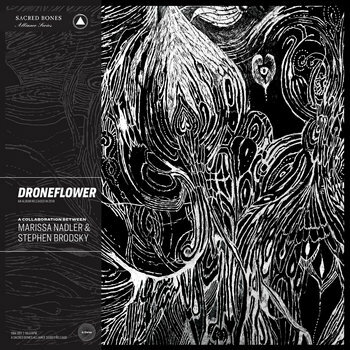 Brainwashed - Marisa Nadler & Stephen Brodsky, "Droneflower"
Marisa Nadler & Stephen Brodsky, "Droneflower"
Brodsky met Nadler for the first time in 2014 at Brooklyn’s Saint Vitus Bar when he came to see her play on her July tour, and they quickly became friends. Both of them had been wanting to explore songwriting that didn't fit into their existing projects, and they soon became energized by the prospect of working together. One of the first ideas they discussed was a horror movie soundtrack, and while Droneflower isn’t that, it is a richly cinematic album. It's easy to imagine much of the record set to images, though it wasn't composed that way. The first song that came together was "Dead West," based around a beautiful acoustic guitar piece Brodsky wrote while living on Spy Pond, just outside of Nadler's home base in Boston. By the time they started working on the song in earnest, Brodsky had moved to Brooklyn. Nadler added lyrics and vocal melodies remotely, and even from a distance it was obvious there was real kismet in the collaboration. All the songs on Droneflower were recorded in home studios, and they throb with the frisson of that intimate environment. For much of the recording process, Brodsky would stop by the ramshackle studio that Nadler set up in Boston whenever he was in town visiting family. Songs like "For the Sun" were written on the spot there, lyrics and all. The lush ambient pieces "Space Ghost I" and "Space Ghost II" began as Brodsky piano compositions and were later fleshed out by additional instrumentation and Nadler’s inimitable vocals. Nadler and Brodsky also recorded two cover songs for the album — the epic Guns n' Roses power ballad "Estranged" and Morphine’s beguiling "In Spite of Me." Since childhood, Nadler had been transfixed by the "Estranged" video where Axl Rose swam with dolphins, and she and Brodsky breathe new life into the song here. Their take on "In Spite of Me" is invigorated by a guest appearance from Morphine saxophonist Dana Colley, who ironically didn't play on the original recording but is indispensable on Nadler and Brodsky's version. Out April 26th on Sacred Bones.